NEW DELHI (AP) - An Indianunmanned mission to the moon will carry two NASA scientific devices designed tofind minerals and ice on the lunar surface, a U.S. official said Tuesday. 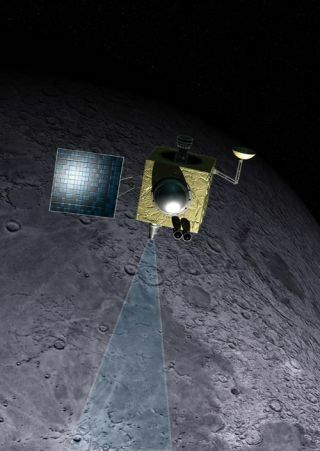 The mission, calledChandrayaan-1, is set to launch in 2007 or 2008, according to the ISRO Website, and will map the lunar surface using an array of sensors. The collaboration,initially agreed on during U.S. President George W. Bush's visit to India inMarch, calls for two NASA payloads to be carried to the moon by a 1,160-pound (525-kilogram)spacecraft. One of the Americandevices, a mini-synthetic aperture radar, will map ice deposits in the moon'spolar regions. The other instrument, called a moon mineralogy mapper, willasses mineral resources, said U.S. Embassy spokesman David Kennedy. Chandrayaan-1 will alsocarry three scientific instruments from European research centers. NASA Administrator MichaelGriffin and ISRO Chairman G. Madhavan Nair signed the deal Tuesday in thesouthern Indian city of Bangalore. Ties between New Delhi andWashington hit a low point when the United States and other Western nationsimposed economic sanctions on India after it tested nuclear weapons in 1998. The sanctions delayedISRO's plans to develop its own engine for launching space vehicles. However, most sanctionshave since been lifted, and a civilian nuclear cooperation deal signed in Marchby Bush and India's Prime Minister Manmohan Singh is seen as the cornerstone ofthe emerging strategic partnership between the world's dominant power and oneof Asia's economic powerhouses. India began its space programin 1972, and has previously used engines from longtime ally Russia to launchsatellites.